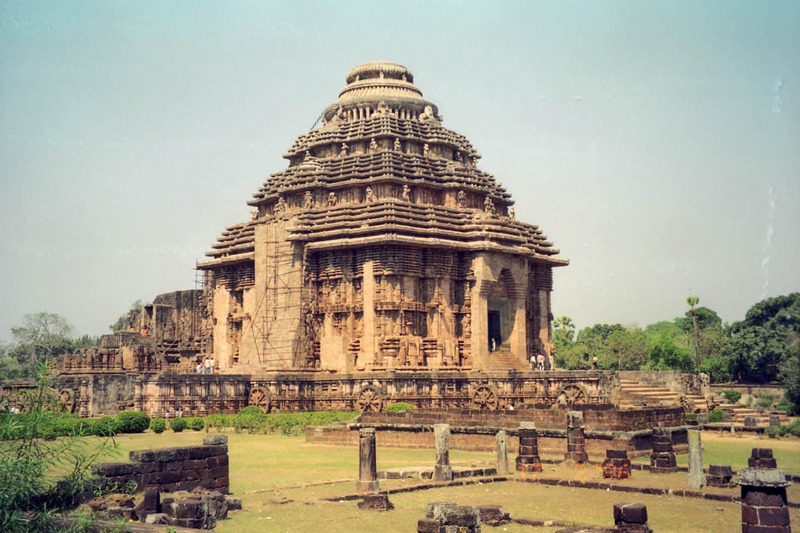 The Sundial at Konark Sun temple in India built in 1250 A.D is a treasure trove of secrets of ancient India. People still use it today to tell time. We know how the sundial works and shows time accurate to the minute. What is interesting is what is missing from the picture! For the uninitiated the sundial has 8 major spokes that divide 24 hours into 8 equal parts, which means that the time between two major spokes is 3 hours. 8 Major spokes. Distance between 2 spokes is 3 hours. There are 8 minor spokes as well. Each minor spoke runs exactly in the middle of 2 major spokes. This means that the minor spoke divides the 3 hours in half, so the time between a major spoke and a minor spoke is an hour and half or 90 minutes. The edge of the wheel has a lot of beads. There are 30 beads between a minor and a major spoke. So, the 90 minutes are further divided by 30 beads. This means that each bead carries a value of 3 minutes. The beads are large enough, so you can also see if the shadow falls in the center of the bead or on one of the ends of the bead. This way we can further calculate time accurately to the minute. 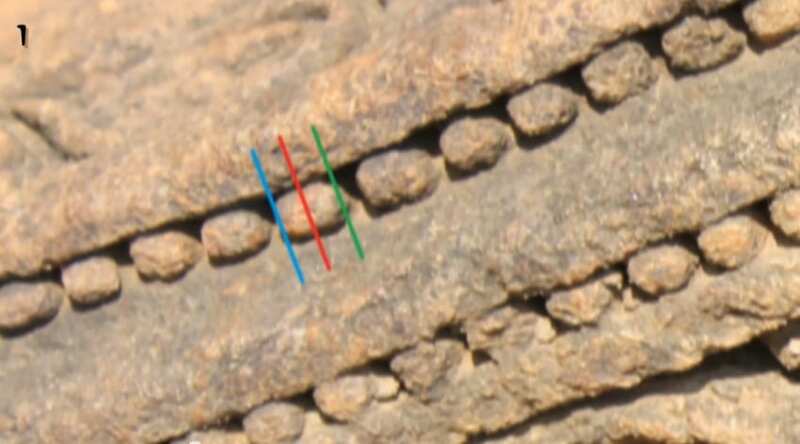 The beads are large enough,to check the shadow position. Imagine how much time and coordination would have happened between the astronomers, engineers and sculptors to create something like this, 750 years ago. There are 2 questions that one would get in their mind. The first question would be, what happens when the sun moves from east to west. 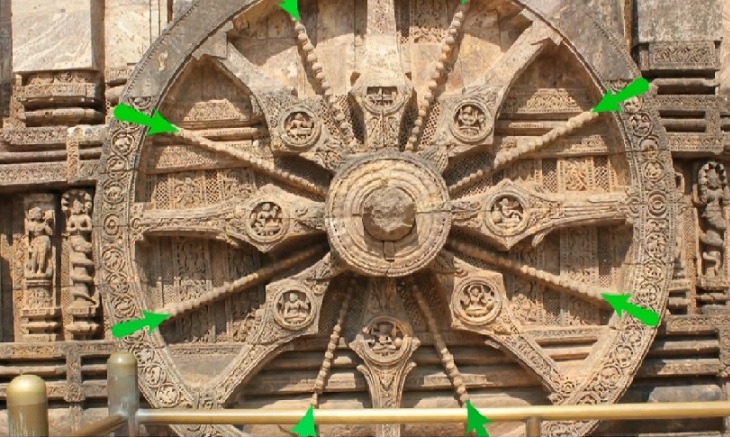 Since the wheel is carved on a wall, the sun would not shine on this wheel at all. How can we tell time in the afternoons? 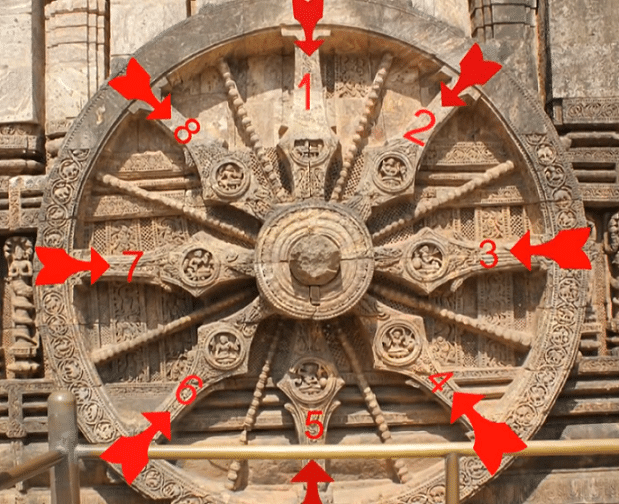 Now, the Konark sun temple has another wheel or sundial, located on the west side of the temple as well. You can just use the other sundial that will work perfectly from afternoon, until sunset. The second and the most interesting question about the Konark sun temple. How do you tell time after sunset? There would be no sun, and hence no shadows from sunset till the next morning’s sunrise. After all, we have 2 sundials in the temple which work only when the sun shines. 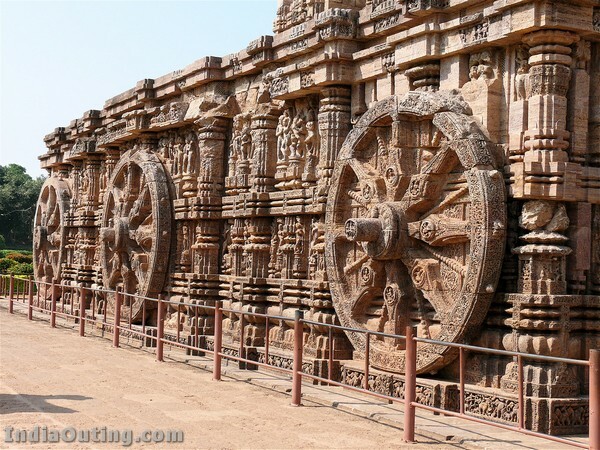 Well, actually, the Konark sun temple does not have just 2 wheels like this. The temple has a total of 24 wheels, all accurately carved just like the sundials. Have you heard of the Moondial? Do you know that the moondials can work just like sun dials during night time? What if the other wheels in the temple could be used as moondials? Many people think that the other 22 wheels were carved for decorative or religious purposes and do not have an actual use. This is what people thought about the 2 sundials as well. 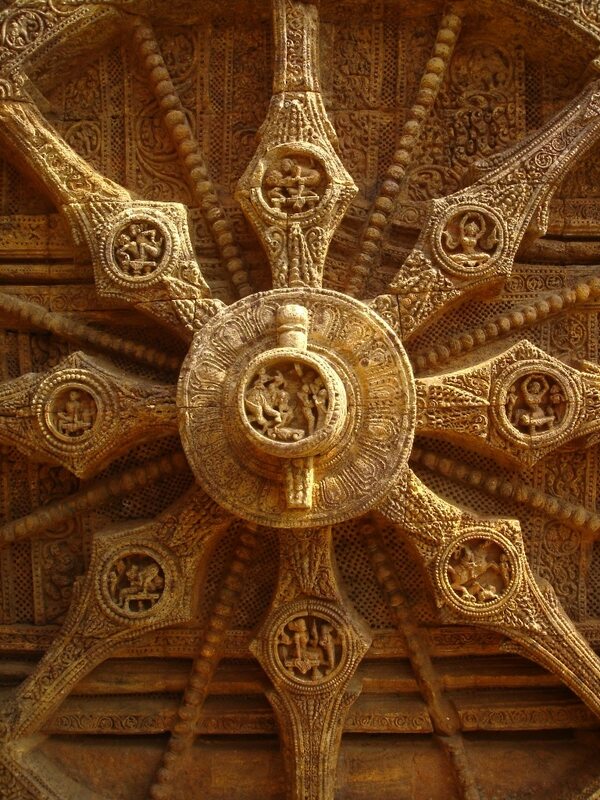 Believe it or not, people thought that all the 24 wheels were just carved for beauty and as Hindu symbols. About 100 years ago, it became known that this was a sundial when an old yogi was seen calculating time secretly. Apparently selected people were using these wheels for generations and for 650 years no one else knew about it. They say that when they asked him about the purpose of the other 22 wheels, the yogi refused to talk and simply walked away. And our knowledge of just these 2 sundials themselves is actually very limited. There are multiple circles of beads. There are carvings and markings all over these sundials, and we don’t know the meaning of most of them. For example, this carving on a major spoke has exactly 60 beads. Some carving you can see leaves and flowers which may mean Spring or Summer. Some carvings you can see monkeys mating, which only happens during winter. So, these sundials could have even been used as an almanac for a variety of different things. Now you can understand how limited our knowledge is about the rest of the 22 wheels. There are clues on these wheels that people have overlooked for centuries. Notice how a woman wakes up and looks at a mirror in the morning. Notice how she is stretching, being tired and ready to go to sleep. And you can also see that she is engaging in sexual activity during night. 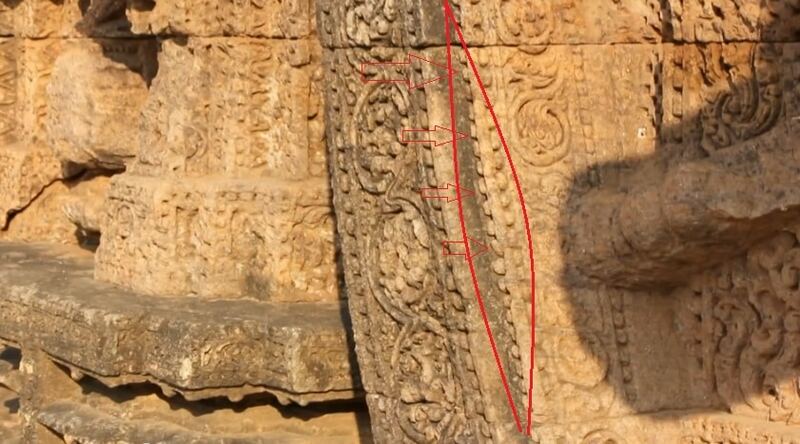 For centuries, people have ignored these hints and thought that these were carvings of Hindu Goddesses. This is also a perfect example of how people think ancient unexplained carvings are just for beauty or religious purposes. If ancient people spent a lot of time creating something, there is a very good chance that it was done for a valuable, scientific purpose.